Beside contented life everyone wishes to live in peace. 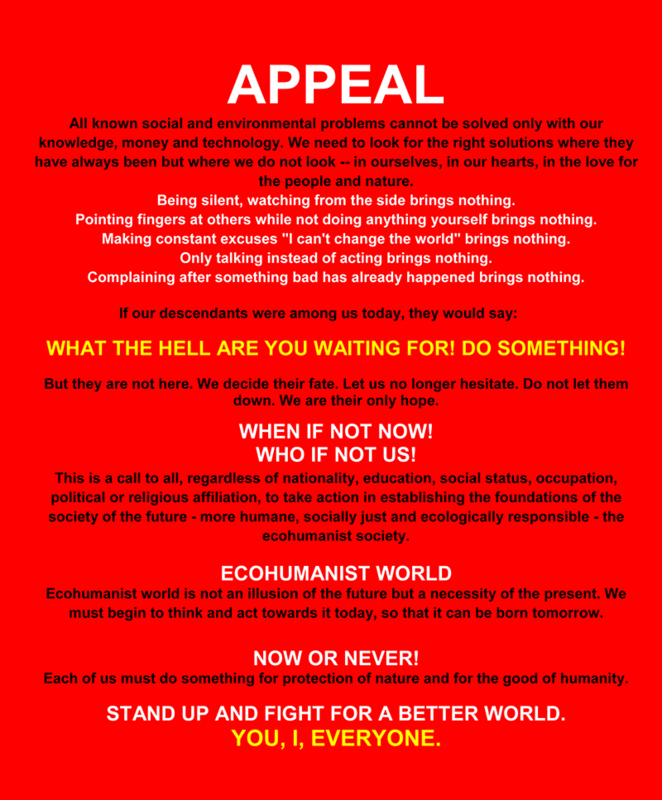 Ecohumanist society follows this call for peace and creates such social mechanisms that prevent the emergence of violence and war. 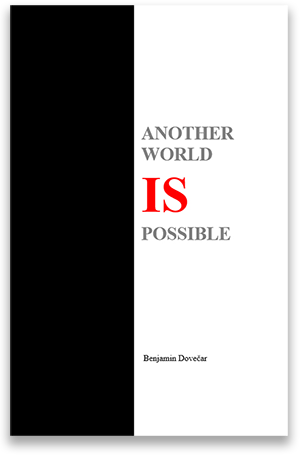 Ecohumanist world is a world without borders and therefore without countries. Its a unified world in which the war belongs to the past. Fear of the war no longer exists. There is peace and freedom of movement. Such a society can devote to building a world of common interests with the aim to secure peace in the future. In an ecohumanist world humanity is a qualitative form of society with content that enable her to maintain a sustainable development. Moderate lifestyle, creativity, solidarity, perception of the need to save the planet’s limited resources, innovation, preservation of an intact environment and an orderly population policies are those conditions that involves the society for preservation of sustainable development. Emergence and development of life is not something we take for granted, is a chain of convenient coincidences, whose product luckily also we are. We are a part of this unique biodiversity and beauty and absolut dependent on it, therefore she to receive is a common task. The Earth is not an isolated planet, but part of the universe that is constantly changing. And these changes also impact on our planet. The Earth travels through our galaxy and with its mass she strongly influenced not only the climate activity, but also whole life on the planet. Although we are helpless against the galactic ecosystem, the knowledge about it can help us better to understand ours. An effective defense against the comet impact, which can destroy the planet, it is also one of the important development goals of ecohumanist society. By accepting the planet as their home, ecohumanist society creates such social conditions and oozes such common decisions, which allow her to explain the Earth as the highest good. The directive on the protection of the planet requires each to be respectful towards nature and considerately and responsibly deal with their gifts. Such attitude towards nature is possible only in such a society that breathes with the planet and that knows only ecohumanist society. A society, which does not deal with the planet, but rated him as something priceless. Society who care about their existence, which does not put her social evolution about biological, but goes hand in hand with her.